The Karroll Brothers have a sound and reputation as one of Canada’s most enduring recording acts. They have evolved and developed their own unique style of “Album Orientated Rock” and have released four albums to date. The Karroll Brothers high-energy “live performances” have established the act as a popular concert draw and the band has shared the stage and toured with many music industry top recording artists and music legends throughout Canada and the USA. With numerous recording sessions developing their “high energy rock”, many of their over 100 original songs recorded to date, co-produced by Peter & Paul Karroll were also influenced by contributing producers and engineers which included, Bob Rock (Bon Jovi, Metallica, Tal Bachman,) Mike Fraser (ACDC, Motley Crew, Satriani) Martin Shaer (Brian Adams, Sweeney Todd) Tom Lavin, (Powder Blues) and Wes Dakus. The Karroll Brothers recently re-mastered select songs from their previously released albums and released “Wild On” CD. Paul & John Karroll are currently writing material for a new album to be released to broadcast media with you tube videos online, with future select “live performances” to be scheduled in support of the album release. Independent Progressive Rockers, the Karroll Brothers. A Western Canadian band hailing from Alberta and eventually making their home in the Interior of BC, and then on the Coast. 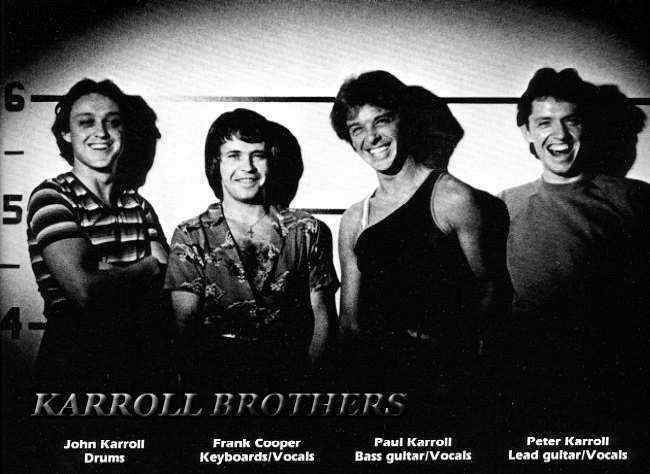 A family affair, the Karroll Brothers were three brothers, John, Paul, and Peter along with Steven Balison (in their first line-up). The group took care of business their way, and it was the right way! Performing all across Western Canada during the seventies, they brought their Hard and Progressive Rock to numerous clubs and cabarets from Winnipeg to Vancouver. I recall seeing the boys at a college cabaret in the latter ‘70’s, and what an impressive sound! They were serious, and had a very professional show, right down to the lighting and sound. Releasing an independent album in 1978, the self-titled record was on their own label K.B. Records. The music was ahead of their time, with guitar/keyboard interplay that would mesmerise. The guys looked tough on stage with leather, armbands and shirtless. In concert, the energy of the Karroll Brothers broke the scale, and left their audiences breathless. 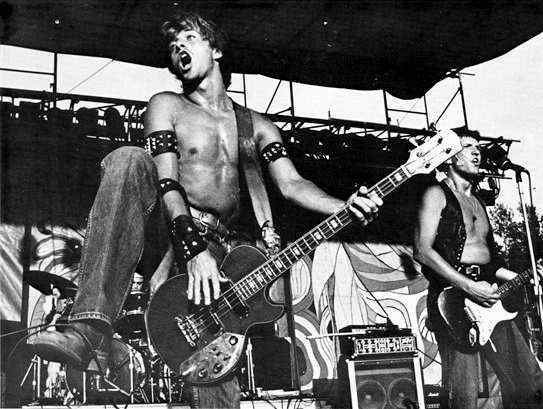 Like their self-titled debut, the group were Epic! “Battlestar Dream” and Morning Light” stand out on the first….showcasing their song-writing abilities, and musicianship. Very English sounding, but with a definite Canadian flavour. During their touring time, they were a big draw in clubs all over Alberta and BC…especially in the interior of our province. If memory serves, it was around 1980 the group released their second record, this time for Rio Records. The sound on “Baby Get Down” was a little more ‘poppy’, again very English and somewhat punky, yet the Keyboard/Guitar signature was still there. Again, the album was arranged and produced by Peter and Paul Karroll and showcased their visionary approach to the music. As we progress through “Baby Get Down”, the music gets heavier and more progressive, especially side two, I know! You have to flip the record! Archaic! Isn’t it? The group’s second effort was a joyful romp through some great mid-tempo rockers, with great vocal harmonies and their signature sound a good listen was ensured each and every time. The Karroll Brothers kept performing on and off throughout the 80’s and 90’s… however the brothers involved themselves in other musical projects, and along the way, forming a production company: publishing and management, all based out of Vancouver. Peter Karroll has been involved with many Canadian Artists, including Bif Naked. All of the brothers have been involved in music and media in a significant way throughout the 2000’s and rumour has it that they will be performing again as the Karroll Brothers. One can only hope…as these guys were on the road to becoming Western Canada’s Premiere Progressive Rock group!